"GATE CITY, Va. -- App Purcell Seaver, 92, died at 1 p.m. Saturday at the home of a daughter, Mrs. Rhea Rose, after a lingering illness. 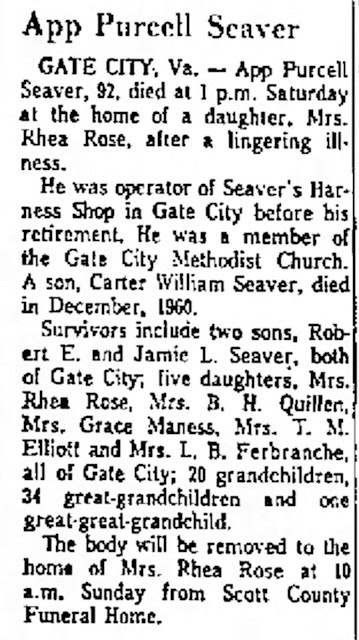 "He was operator of Seaver's Harness Shop in Gate City before his retirement. He was a member of the Gate City Methodist Church. A son, Carter William Seaver, died in December, 1960. "Survivors include two sons, Robert E. and Jamie L. Seaver, both of Gate City; five daughters, Mrs. Rhea Rose, Mrs. B.H. Quillen, Mrs. Grace Maness, Mrs. T.M. Elliott and Mrs. L.B. Ferbranche, all of Gate City; 20 grandchildren, 34 great-grandchildren and one great-great-grandchild. "The body will be removed to the home of Mrs. Rhea Rose at 10 a.m. Sunday from Scott County Funeral Home." 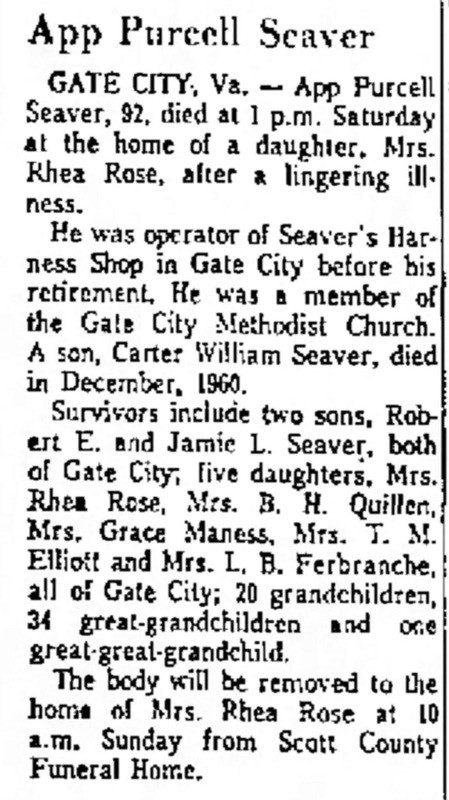 "App Purcell Seaver" Kingsport [Tenn.] Times-News newspaper, obituary, Sunday, 12 March 1961, page 4, column 1, App Purcell Seaver obituary; Newspapers.com (https://www.newspapers.com : accessed 21 March 2019). No age, birth date or birth place was provided for App Purcell Seaver. A death date of 11 March 1961 can be inferred from the obituary (Saturday, presumably the day before the obituary appeared in the newspaper). The real prize here are the names of the eight children, but only two of the daughters has a first name listed (unless "Rhea" is a husband's name!). I did not have spouse names for Ethel, Grace, Garnet, or Jamie. On Find A Grave, I found most of these children buried in Holston View Cemetery in Weber City, Virginia. Ethel R. is Ethel Rhea Seaver Rose, wife of Frank R. Rose; Grace's husband is Richard S. Maness; Garnet's spouse is Paris M. Elliott.